Bunk beds have always been great pace savers into small bedrooms but they have also been very popular among children and even teenagers. They are a very fun and nice looking furniture item loved by kids and their parents alike, but in the same time they are very practical and reliable for any small bedroom. They are available in varied types and styles but the most common is twin over twin bunk bed. It is composed by two similar twin beds, placed one in top of another. This style can be also available in twin over full, twin over futon or even full over full, but the proper style you need depends only on your preferences and available space you have. The twin over futon bunk bed is a very good option, especially for teenagers who need a seating area into their rooms, because the lower bunk can be turned into a couch. Another good thing about bunk beds is that they can offer additional storage space for clothes or toys. The space under the lower bed can be filled with storage drawers which are usually available in the same material and color as the bunk bed’s frame. Bunk beds usually come in a variety of colors and made of different materials, usually wood or metal, but both are very resistant. 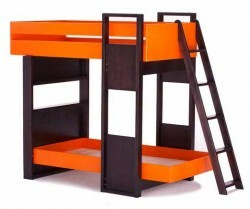 The bunk beds made of wood are the most attractive and can be designed in a variety of shapes. Sometimes, it can be very difficult to decorate the kid’s room specially when the space is limited, but using bunk beds could be a really good option. They will help you to save floor space and also can offer good storage space. There is a variety of styles available for you to choose what you prefer the most. It will be a delightful fixture for your kid’s room.